This enormous home sits on a slight hillside with circular drive and custom built all brick fountain with under lights amidst lush landscaping, giving it a truly regal presence. Beautiful, bright open floor plan, stunning two story foyer and family room, cherry gourmet kitchen with center island, office with built-ins, master suite with his and hers walk-in closets and luxurious all stone master bath with custom vanities. Exceptional quality amenities highlight the characteristics of this splendid residence. 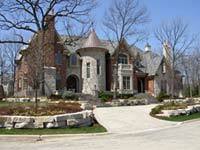 This elegant European style home is located in a beautiful gated subdivision in Burr Ridge. 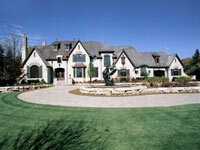 9,000 square feet of magnificent blend of architecture, world class finishes, exquisite decorating and technology. Three levels of perfection offer two custom staircases, grand formals, breathtaking two story family room, a dream culinary kitchen with enormous center island and octagonal breakfast area, five generous bedrooms, seven opulent baths and all walnut library. Fabulous lower level includes custom bar, state of the art home theatre, secondary living room with stone fireplace, exercise room with sauna and all brick wine cellar. Wonderful back yard offers blossoming landscaping, huge paver brick terrace, built in grill and custom made pergola. All these features come perfectly together in one exceptionally elegant residence. 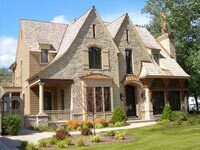 Exceptional European inspired, cedar and stone three story home located close to downtown Elmhurst . Old world craftsmanship and modern convenience. Cherry wood flooring and elaborate trim package are shown throughout the home. Unique floor plan features five bedrooms with walk-in closets; five stone and granite bathrooms; a dream kitchen with cherry cabinetry and stone flooring; beautiful dark stained paneled library; generous formals; and living room with stone fireplace and wet bar area perfect for entertaining. A winner of the ‘Silver Key’ award for outstanding design in architecture sponsored by Home Builders Association of Greater Chicago. This outstanding residence, located in sought-after northeast Hinsdale, offers wonderful spacious rooms, fully equipped chef’s kitchen, elegant formals, screened porch and dramatic all wood library. Architectural ceilings, custom millwork, gleaming hardwoods are showcased throughout the home. Elegant appointments both inside and out. A winner of the ‘Gold Key’ award for outstanding design in architecture sponsored by Home Builders Association of Greater Chicago. 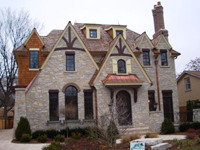 Exquisite English stone and cedar residence with top quality construction and detail. Featuring a dreamy cook's kitchen with custom cabinetry, granite countertops, top-of-the-line appliances and walk-in pantry; five bedroom suites including an elegant master suite with wet bar and private balcony. Lower level features secondary family room with fireplace and wet bar area, wine cellar, media room and exercise room. Screened porch with a fireplace and stunning cherry wood library complete the interior of this remarkable residence. Architectural ceilings and stone and cherry wood flooring are featured through out the home. A winner of the ‘Gold Key’ award for outstanding design in architecture sponsored by Home Builders Association of Greater Chicago. A residence of a magnificent architectural detail. This stylish and loaded with amenities home offers an open floor plan for both family living and elegant entertaining. Five generous bedrooms with private baths, an upscale kitchen with exquisitely crafted cabinetry, spectacular two story family room, walnut wood library with built-ins, year round screened porch. Extremely high end finishes, finest appliances, and state of the art technology. Grand entrance, circular drive with exquisite fountain, abundant landscaping, sprawling terrace with fireplace, in ground pool and hot tub complete the fabulous picture. Superb new residence beyond comparison in prestigious "Woods of Wayne" community. Outstanding blend of architecture and best finishes are featured in this home. Unique floor plan of 5400 sq ft of living space offers 4 bedrooms, 4 baths, two-story great room with wall of windows to enormous back yard, elegant formals, study, meticulously designed kitchen, four seasons room, full lower level, 3 car garage, and much more! Exquisite use of limestone, marble, decorative moldings and accents in overall old world craftsmanship. This sensational residence exemplifies grandeur and elegance. Incomparable in style, scale and taste. Indulge in over 10,000 sq ft of sophisticated architecture, luxury and finest details. Be amazed right from the start with incredible two story foyer with 16 ft Venetian plaster dome ceiling followed by wonderfully appointed formals, six generous bedrooms, eight baths, stunningly designed kitchen with extraordinary detail, handsome cherry library. Enormous lower level offers custom wet bar and fireplace, wine cellar, game area, exercise room, additional bedroom and high-tech theater. Sprawling porch and patio, fireplace, built in grill and fridge, fire pit complete this lavishly landscaped back yard with plenty room left for the pool. Living life at its best with every possible amenity included. Superb craftsmanship and lavish finishes set this custom residence in a class of its own. With its gallery of fine woods, exquisite stone work, elaborate trim and countless architectural touches, each room is defined by thoughtful design and careful attention to detail. Dramatic & powerful interior spaces are perfectly proportioned, each room flowing gracefully from one to another, providing an atmosphere of incomparable elegance. A flawless combination of old world charm and today’s luxury amenities offers deluxe 1st floor master suite, impressive kitchen open to two-story beam ceiling family room, elegant study and dining room, three bedroom suites, multiple laundries. Enormous walk-out lower level features custom bar, all stone wine cellar, sauna, hot tub room and more. Extensive outdoor terraces complete with summer kitchen, fireplace and fountain offer an unparalleled setting for gracious alfresco entertaining. This beautifully presented home enjoys a timeless appeal in a spectacular setting.